the way to Australia 25 March sine 'became the first nuclear powered submarine to successfully launch a guided missile. 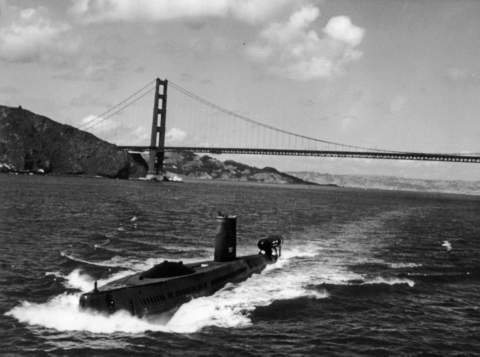 The submarine 'returned to Mare Island Shipyard 18 June 1960, and after short training cruises departed 7 November for Pearl Harbor and active service with Pacific Fleet. During her first deployment she successfully launched her seventh consecutive Regulus I missile during a major Southeast Asia Treaty Organization weapons demonstration. Returning to Pearl Harbor 9 April 1961, Halibut began her second deployment 1 May. During the months that followed she participated in several guided missile launching exercises and underwent intensive training. Halibut deployed for the third time to the Western Pacific in late 1961, establishing a pattern of training and readiness operations followed through 1964. On 4 May 1964 Halibut departed Pearl Harbor for the last Reg-ulus missile patrol to be made by a submarine in the Pacific. Then, from September through December, Halibut joined eight other submarines in testing and evaluating the attack capabilities of the Permit Class submarines.